Diverse experience is great, but how do you put it in a resume? The life of an entrepreneur is like a roller-coaster ride — it can be incredibly exhilarating, but also uncertain and stressful. As a business owner, you have the freedom to call the shots, but that freedom comes at a price: From the pursuit of new clients to balancing the books, small-business owners must reach beyond their area of expertise and wear many hats to build and maintain a successful business. No one knows this better than Hannah Eldeen. For most of her 20-year career, Hannah (not her real name) has been an entrepreneur in marketing and business intelligence (BI). While she’s enjoyed managing her own marketing agency, Hannah admits it has its drawbacks. Needing to find simplicity, Hannah is now looking for a role where she can leverage her talents in one role and for one client: her employer. But the job search has proven to be more complicated than she expected. When it writing her resume, Hannah was faced with the challenge of compiling her vast experience into a single, cohesive document. The result was a series of fragmented stories and unclear objectives that didn’t represent her as the strong, competent professional she is. Hoping for some guidance, Hannah entered TopResume’s inaugural resume-makeover contest and was this month’s lucky winner. She worked with one of our professional resume writers, Traci, and together they developed a focused document that does justice to Hannah’s experience and skills. Hannah’s work experience is so diverse that she found it difficult to create a resume that properly described her background and stayed within the space constraints. At one point, Hannah had even written four versions of her resume — one for each direction she could take her career — in an attempt to better focus her documents. And while Hannah successfully used her storytelling abilities to share her accomplishments, her online applications seemed to be getting lost in the dreaded resume black hole. With this information in mind, Traci set out to streamline Hannah’s resume into one, cohesive document that shows employers what Hannah has to offer the senior ranks of corporations. In addition, she focused on creating an ATS-friendly resume design and layout to ensure her applications reach the hands of the decision makers. 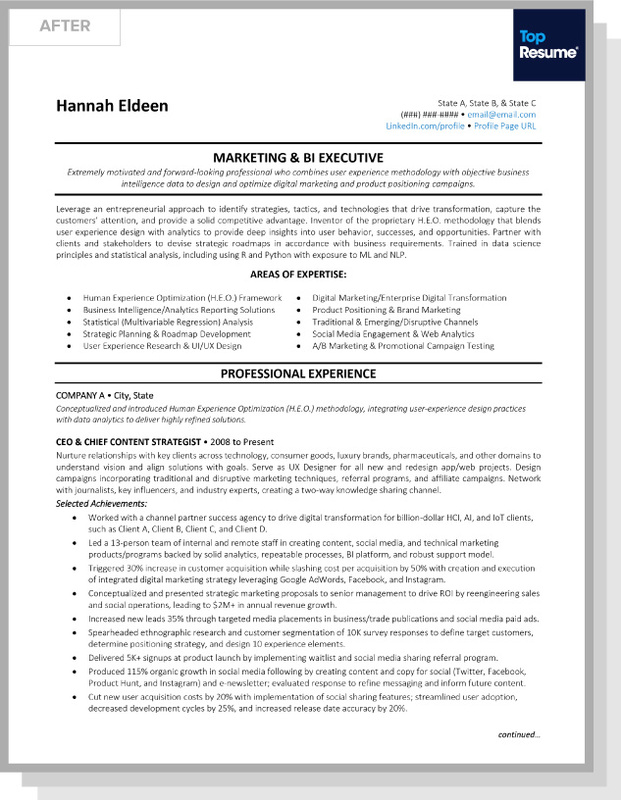 Below is a look at seven of the changes Traci made to Hannah’s resume for her transition from business owner to corporate employee. Hannah has a robust web presence, from her LinkedIn profile to her business website to profile pages on multiple platforms. While this is great for building Hannah’s personal brand and network, it doesn’t all need to be crammed into her resume — hiring managers shouldn’t have to spend time deciding how to contact an applicant. These important details should be displayed front and center and impossible to miss. Since Hannah’s career background is so diverse, she struggled to summarize her skills and clarify her immediate job goals. Traci added an executive summary to Hannah’s resume to include her professional title, a compelling power statement, and a section for all of her areas of expertise. As a result, Traci was able to emphasize Hannah’s entrepreneurial background while still highlighting the skills that would be valuable in a corporate setting. Graphics, photos, and columns may look pleasing to the human eye, but the truth is, the human eye is not always what sees your resume first. 95 percent of Fortune 500 companies use software known as applicant tracking systems (or ATS, for short) to scan resumes and filter out the least-qualified candidates before sending the remaining resumes to hiring managers. And the ATS does not respond well to graphics. It is not able to read them, so a resume that includes images can become a garbled mess that ultimately distracts from the most important things — qualifications and experience. 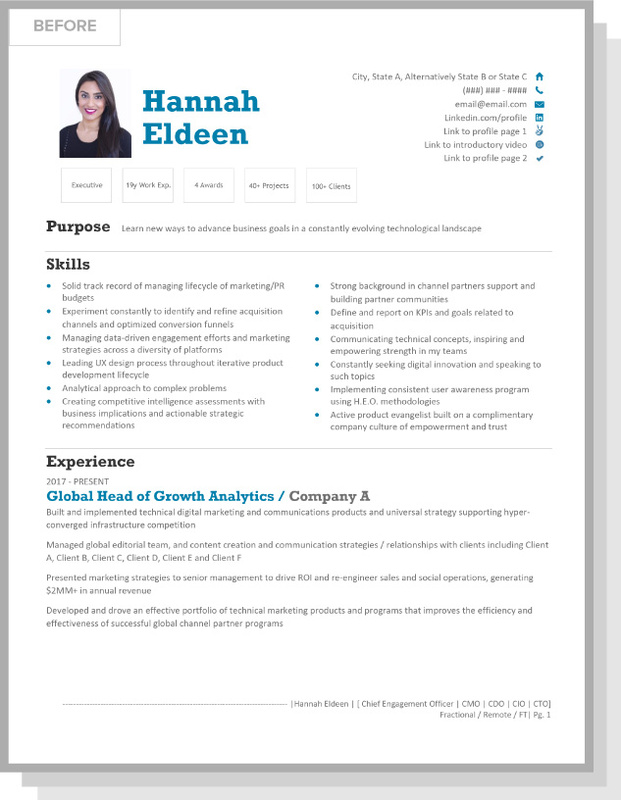 Traci removed the graphics from Hannah’s resume for this reason, making it ATS-friendly and more likely to make it to a recruiter’s desk. 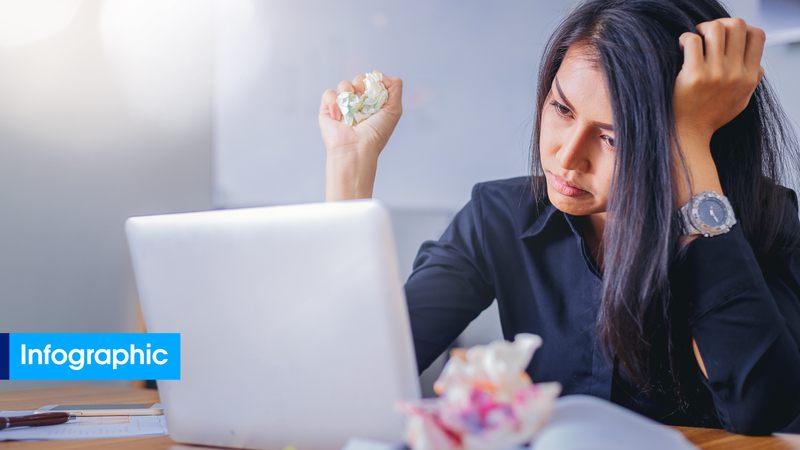 One of the most common resume-writing mistakes many of us make is to list out our responsibilities rather than highlight accomplishments and the impact we had in our roles. Traci steered Hannah in the right direction by emphasizing the results she delivered to her clients. Things like statistics and monetary values demonstrate measurable accomplishments, which showcase the value Hannah can bring to an organization. By positioning Hannah as an “achiever” instead of a “doer,” Hannah’s new resume proves her value and paints her as an attractive candidate. Are you a doer or an achiever? Find out if your resume does your accomplishments justice with a free and simple resume review. Consulting jobs can be difficult to incorporate into a resume because of the number of clients. Hannah wanted to highlight those projects, but listing each individually could give the impression she had a lot of short-term positions. Instead, Traci consolidated Hannah’s consulting work under one overarching position, highlighting client names but keeping accomplishments as part of her overall work within the company. To show the diversity of Hannah’s experience, Traci then focused on two more significant positions outside of her company. As previously noted, Hannah’s experience is extensive and wide-ranging, resulting in one of her biggest challenges when writing her resume: limiting it to an appropriate page length. After detailing Hannah’s most recent and important roles, Traci added a “Career Note” to cover older positions. This allowed Hannah to add context and color her career journey while keeping the emphasis on her recent work and maintaining an acceptable page length. Two pages is the standard resume length for experienced professionals, but one size does not necessarily fit all. For Hannah’s case, Traci explained that “She has completed many professional development courses with Ivy League universities. She’s also worked with numerous clients in multiple industries.” Traci added a third page to Hannah’s resume to include this supporting information, as well as her comprehensive list of technical skills. Do you know how many pages are right for your experience and skill set? Our professional resume writers are here to guide you. When writing a resume, it’s easy to get swept up in the tales, trials, and tribulations of your career. However, your resume is not meant to be a career biography. Part of the role of a professional resume writer is to be an objective pair of eyes — to take your story and rework it to reflect what hiring managers want to see and get your foot in the door. In the end, Traci was able to write a resume for Hannah’s transition that included her career narrative but also emphasized her deliverables. Want to be our next winner? Enter to win a resume makeover with TopResume today!